Child abuse, aggravated, age of child raised to 14 years for purposes of charging with Class A felony, Sec. 26-15-3.1 am'd. 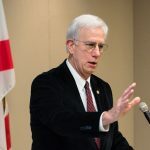 To authorize the Alabama Department of Corrections to establish a pilot program to provide bonuses to assist in correctional officer hiring and retention. The Alabama Department of Corrections shall have the authority to establish a pilot program designed to increase correctional officer hiring and retention by offering bonuses or educational incentives, or a combination of both, to correctional officers for remaining employed by the department for consecutive terms of employment to be established by the department and subject to the availability of funds. Unless otherwise authorized by an act of the legislature, the program established under this bill shall expire on December 31, 2020. It is not the intention of this act to make appropriations, but the program established by the department is subject to the appropriations made for the department in the annual budget act. This act shall become immediately effective following its passage and approval by the Governor, or its otherwise becoming law. March 28, 2018 H Assigned Act No. 2018-505.